← Signing email with “best” – Best what? Best Fruitcake? Count me out! It never ceases to amaze me. In windows XP, it was a common joke that Microsoft couldn’t predict how long something might take. You’d get “4 minutes, 17 minutes, no wait, 2 minutes, no… 2 days 14 hours, no 30 seconds…” Their estimates were so wildly off that there was absolutely no point in paying attention to them, unless you wanted a chuckle. So from this, I am to believe that it’ll take an hour to copy 2GB of data, and 6 hours 30 minutes to copy 193G. That doesn’t seem very consistent. 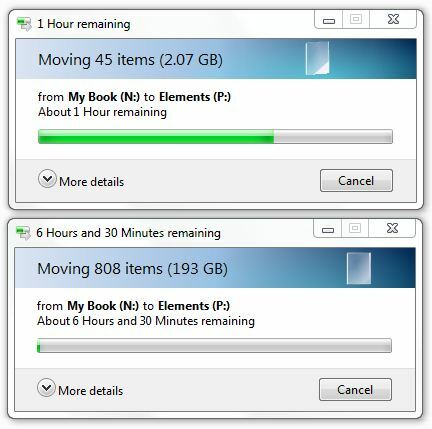 A few minutes prior, the top one was indicating 23 hours to do the copy, and the bottom one was about the same. The top one actually took 11 minutes to complete. Come ON, guys! This isn’t rocket science. It’s a very VERY simple thing to sample how long it’s taking you to do a task, and knowing how much more you have to do, it’s TRIVIAL to calculate how much time that will take. Sure, you can make it more clever by doing moving averages and so forth to allow for fluctuations in resource availability or WAN vagarities. Still, it’s NOT difficult to be somewhat close even if you don’t try to refine estimates in this manner. Other software manufacturers are able to surmount this seemingly impossible task, as their progress indicators actually seem to be reasonably accurate. I think that at this point, given years of demonstrated inability to accomplish this absolutely overwhelming programming task, Microsoft should simply remove the time estimates from their products. They are not useful to the customer, and they are embarrassing for Microsoft. Isn’t anybody over there even slightly embarrassed? If it were my company, this would get fixed, or heads would roll. I know there are a lot of smart people at Microsoft – give the problem to one of them instead of the morons who have been working on it to date.